A major community initiative that Specsavers implements in stores nationwide is the ‘Specsavers Community Program’. The initiative aims to raise funds for Specsavers’ national charity of choice, The Fred Hollows Foundation, as well as hundreds of local charities across the country. To date over $3 million has been donated to charities through the Specsavers Community Program. Specsavers donates a portion of every glasses sale to the Lions Outback Vision Van project through The Fred Hollows Foundation. The Lions Outback Vision Van is a mobile eye health clinic that provides comprehensive ophthalmology care for people living in remote and rural Western Australia. For every pair of glasses sold at Specsavers stores nationwide, the local store owners make a donation to both a local charity of their choosing and Specsavers’ national charity partner, The Fred Hollows Foundation. This has seen millions of dollars donated to Australian charities and thousands of lives changed for the better. Following the introduction of a new Specsavers uniform, Specsavers staff across Australia and New Zealand are supporting their local communities by paying for their old uniforms to be recycled and turned into something useful by a charity that empowers at-risk youth. Specsavers is also very proud to sponsor the Fred Hollows Humanity Award each year. The award recognises Year 6 students across Australia who show compassion, integrity and kindness in their lives, just as Fred did. We’ve launched a nationwide glasses recycling program in partnership with Lions Recycle For Sight that delivers quality glasses and sunglasses to people in need overseas. To make a difference, simply bring your pre-loved glasses into your local Specsavers store and place them in the glasses recycling box or hand them to a team member. Specsavers stores get behind hundreds of local charities in Australia. Read the stories of some of the major Specsavers Community Program fundraising projects below. 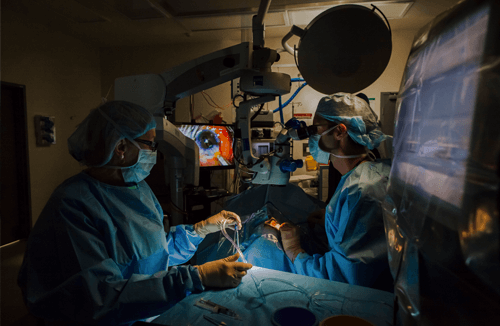 More than $120,000 has been donated to Chris O’Brien Lifehouse, which has been used to perform surgeries on 30 different patients using a state of the art surgical robot. Specsavers stores in NSW supported Taronga Conservation Society across three months and raised funds equivalent to three months’ worth of nutrition for the entire animal population across both Taronga Zoo and Taronga Western Plains Zoo. Princess Margaret Hospital making more thorough diagnoses of serious eye conditions thanks to new Pentacam machine donated by Specsavers stores in WA.